Not long after Panagiotis came to his senses when his conscience began to bother him for giving up his Christian faith. He therefore decided to seek peace by going to Mount Athos, and there he entered the Holy Monastery of Great Lavra. At Great Lavra he found a wise elder named Timothy, to whom he subjected himself and confessed his sins. After some time he became a monk and took the name Paul. Then he and his spiritual father Timothy went to settle in the Skete of Saint Andrew, where they lived for three years. Weeping for his sins day and night, it was there that Paul became inflamed with a desire for martyrdom. At the Skete of Saint Anna was an elder who helped prepare such men who desired martyrdom to face that which they desired. His name was Hieromonk Ananias. Paul fled to Elder Ananias when he was 25 years old. The elder saw his zeal and enthusiasm for martyrdom, but still wanted to put him under a forty day trial period to make sure he was ready to enter the contest of martyrdom. After forty days of very strict fasting, prayer, vigils and thousands of prostrations, he received the blessing of the elder and returned a spiritual giant to Tripoli. At first he went to the Monastery of the Great Cave in Kalavryta, where he lived for another forty days under strict asceticism. 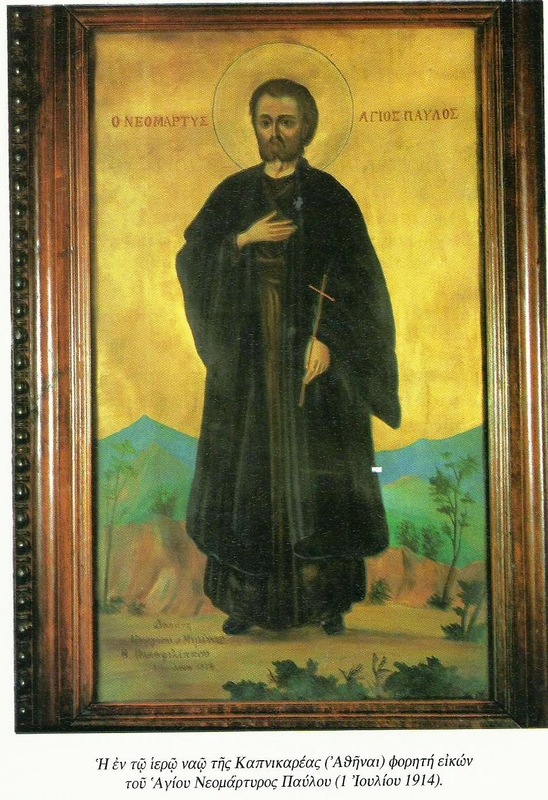 After this he returned to Tripoli, where he heard his cousin in Nafplio had become a Muslim and he desired to convert him back to Christianity. Returning to Tripoli, he went to the mufti to receive permission to be seen by a judge. Receiving the permission, he stood before a judge and confessed his faith in Christ as the true God, while rebuking and reviling Islam. The judge tried to persuade Paul to not make such a foolish decision that would cost him his life, but Paul remained firm in his faith. For this Paul was sentenced to be burned alive. However, certain Turks prevailed upon the judge to make him suffer more by being beheaded with three strokes instead of one, which is a most painful death. As Paul was led to be executed, many Turks took the opportunity to beat Paul. Arriving at the place of execution, Paul knelt and prayed and then told the executioner: "Now I want to see if you are as brave as you say." The executioner then beheaded Paul with one stroke. This took place on May 22, 1818. His body was left out to hang for three days for all to see, then thrown into a garbage dump near the residence of the pasha so as not to be discovered by the Christians. But twenty days later two Christians found his body and secretly took it, and after carefully washing it they had him buried at the Monastery of Saint Nicholas Varson, about twelve kilometers from Tripoli, where also the Holy New Martyr Demetrios (Mitros) was buried on April 22, 1803 after being beheaded on April 14th in Tripoli. 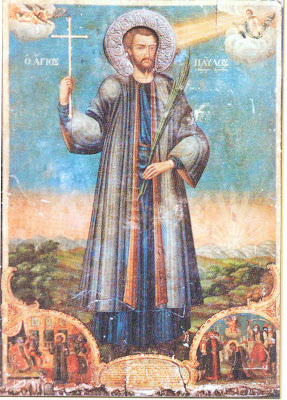 Saint Demetrios is celebrated on MApril 14th, though sometimes they are listed together on May 22nd. Both Saints Paul and Demetrios are considered patrons of Tripoli. 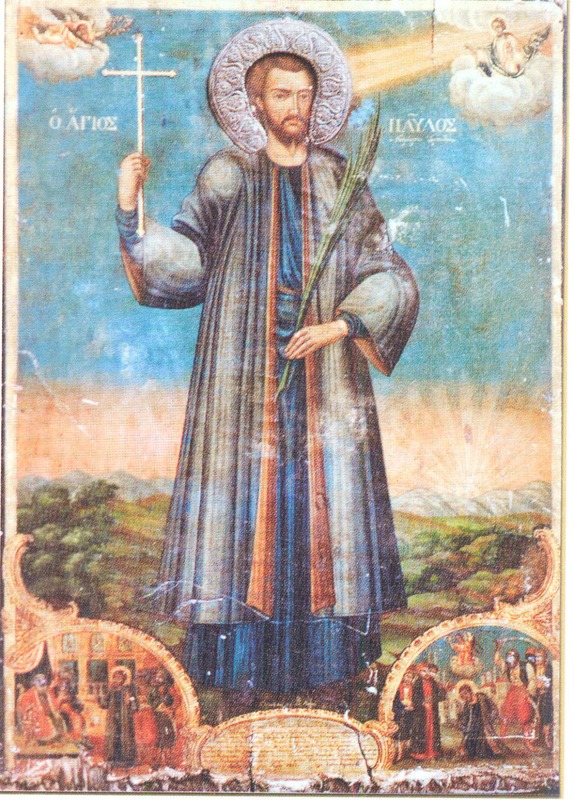 The story of Saint Paul was written by Hieromonk Iakovos Vertsagias of Zakynthos, an Athonite monk at the Russian Skete of Saint Andrew. A church was built dedicated to the Saint in Tripoli and his icon was placed in the Church of the Entrance of the Theotokos in Kapnikarea of Athens on July 1, 1914.